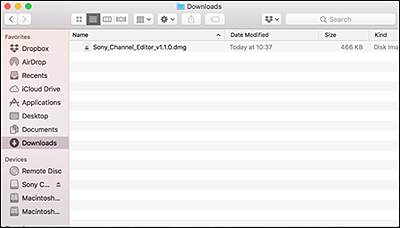 The Sony Channel Editor tool allows you to re-order your channel list via your PC. Simply download the list onto a USB stick, edit the order and then upload it back to your TV. Sony Channel Editor is a smart tool that allows you to modify your channel list with ease. The simple design and powerful functions enable you to move, delete and sort your channels, allowing you to personalise your TV. Note: Your software may already be up to date. Before you install this software, you'll need to download it from the Internet and save it to your Mac. Download [SONY_CHANNEL_EDITOR_V1.2.0.DMG] to your computer and open it. Click the [Download] button on the bottom of the page to download the setup file on your Mac. 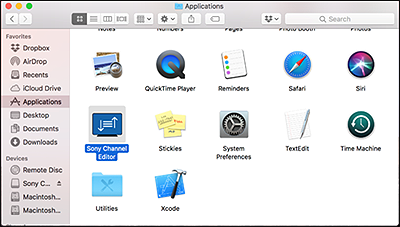 Drag and drop “Sony Channel Editor” into your Applications folder. 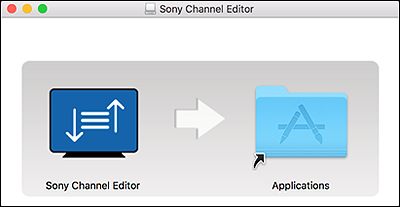 Launch the Channel Editor by opening “Sony Channel Editor” from your Applications folder. The Sony Channel Editor tool is now ready. Export the channel list from your TV. Modify the channel list on your computer. Import the modified channel list to your TV. For more information, please follow the steps below. Insert an external USB memory into a USB port on your TV. A file called “sdb.xml” will be copied onto your external USB memory. Insert the external USB memory with “sdb.xml” into a USB port on your computer. Save your modified channel list onto “sdb.xml” in the external USB memory. Insert the external USB memory with the modified “sdb.xml” into a USB port on your TV. For more information, please visit the full user guide here.